In the early 1600s, French explorers made alliances with the Algonquins, Montagnais, and Hurons to gain access to rich fur territories. Indigenous peoples pursued these alliances with the French as a means of securing a wide range of European manufactured goods, but cloth, firearms, and metal weapons were among the most sought after. By the early 1700s, the fur trade was firmly established in the Great Lakes region. The French empire was based on the fur trade in this region and required Native American alliances to sustain it. Native people and the French traded, lived together, and often married each other and built families together. Native Americans in the Great Lakes and Mississippi valley regions often incorporated Frenchmen into their societies through marriage and the ritual of the calumet — the ceremonial pipe that brought peace and order to relationships and turned strangers into kinfolk. Throughout New France, many Native Americans converted to the Catholic faith, settled in French mission villages, attended Mass, and wore crucifixes. Many Native Americans, however, continued to practice their traditional religion or to observe a mixture of the two, and the French did not resort to forced conversions as the Spanish did. 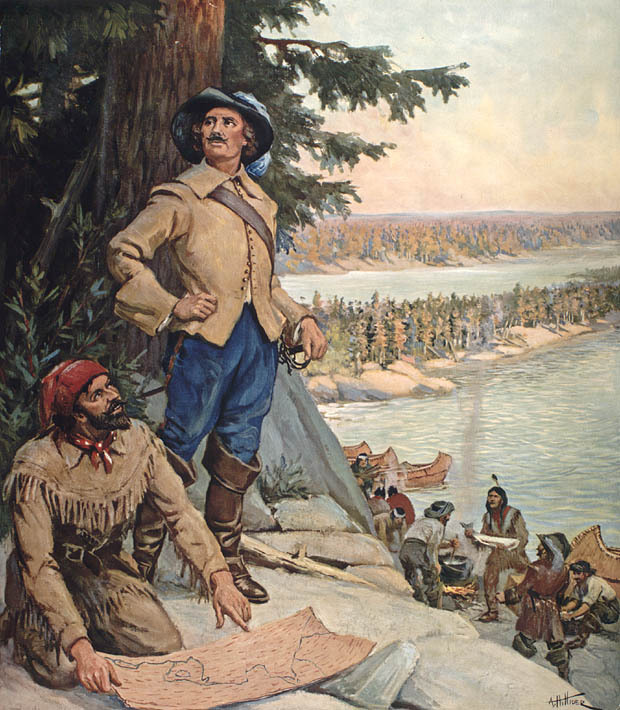 Voyageurs (travelers in French) were men hired to work for the fur trade companies to transport trade goods throughout the vast territory to rendezvous posts. At the rendezvous points, these goods were exchanged for furs, which were then sent to larger cities for shipment to the east coast. Many traders and voyageurs married Native American women and were integrated into their Native kinship networks, frequently trading exclusively within their particular community. The French and Native people lived together in an often egalitarian fashion, ate the same foods, dressed similarly, and suffered the same hardships. As a result of generations of intermarriage, cultural differences began to blur as “mixed” children entered the fur trade. 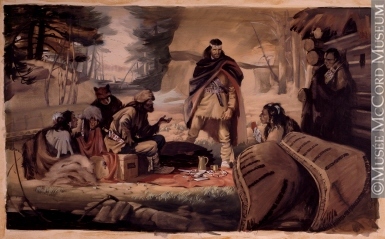 The French and Native trading system created a unique fur trade culture consisting of large communities with people of diverse heritage. French-Native relations also brought chaos to the region. The fur trade brought the spread of guns, contagious diseases, and alcohol. French demand for Native slaves resulted in Native people raiding other Indigenous communities. Slavery existed in North America long before Europeans introduced the transatlantic slave trade. Native Americans often took their enemies captive rather than killing them and held them as subordinate people. Sometimes they gave these people as gifts while making alliances, at other times families adopted them in place of deceased relatives. But European colonialism introduced different concepts of slavery, brought new slave peoples to America from Africa, and drove Native-Native slave raiding to unprecedented levels. Slavery was an integral part of the fur trade during this period. Trade with the French flowed along the extensive network of waterways from French settlements along the St. Lawrence River like Montreal and Québec City, to posts in the interior at Mackinac and the upper Mississippi. The French empire depended on maintaining a network of Native alliances, and so French officials, traders, and officers tried to employ diplomacy, tact, and respect for Native culture. These relations sustained the business of the fur trade. The French traded iron tools, kettles, wool blankets and other supplies for the furs to make hats, while Native peoples exchanged furs for goods from around the world. Gitlin, Jay. Bourgeois Frontier: French Towns, French Traders, & American Expansion. New Haven: Yale University Press, 2010. Color reproduction of a painting entitled La Vérendrye at the Lake of the Woods. Painting: ca. 1900; reproduction: ca. 1900 – ca. 1933 Color reproduction of a painting entitled La Vérendrye at the Lake of the Woods. Source: Wikimedia. Painting of Father Jacques Marquette preaching to Native Americans. 1869. 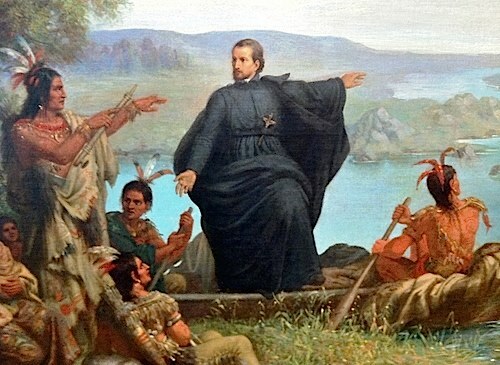 Painting of Father Jacques Marquette preaching to Native Americans. 1869. Source: Wikimedia. Radisson & Groseillers Established the Fur Trade in the Great North West, 1662, by Archibald Bruce Stapleton 1917-1950, 20th century. Radisson & Groseillers Established the Fur Trade in the Great North West, 1662, by Archibald Bruce Stapleton 1917-1950, 20th century. Source: Wikimedia.